As part of the 57th Biennale di Venezia, a new exhibition of Jason deCaires Taylor's work is now open, starting from the 12th May to 27th of November at the Official National Pavilion of Grenada, the country where, in 2006, he began the first of his underwater works that now span several continents and total over 800+ submerged sculptures. 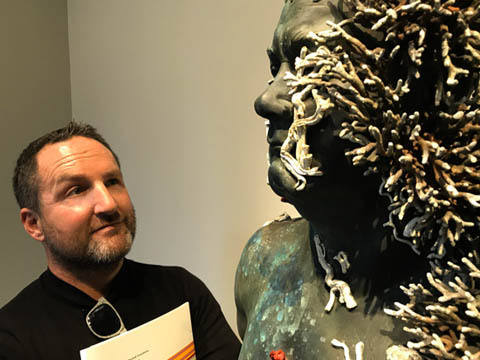 The works on display feature a collection of large-scale photographic prints and a series of new sculptures focussing on coral bleaching. Between 2014 and 2016, the longest global bleaching events ever were recorded. According to the United Nations Environment Programme, these bleaching events killed coral on an unprecedented scale. In 2016, bleaching hit 90 percent of coral on the Great Barrier Reef. A pulsating new short film of Museo Atlantico in Lanzarote is now online. The Museum has seen populations of marine life dramatically escalate over the past year on an area of once deserted seabed. “Over the past 11 years working underwater I have always hoped my work was about giving something back, creating new life and providing glimpses into a fragile imperilled world. After viewing Hirst’s latest exhibition it seems I have certainly created an art genre that has been responded to, but his marine facsimiles are very different in context from my living installations. If people really want to see “unbelievable treasures” they should look below the surface of our seas at the real live wonders of the blue world – nature does not lie". Copyright (C) 2017 Jason deCaires Taylor All rights reserved.